Keter is the source of all, including the things as yet unmanifest. Stabilizing consciousness at this sphere, and bringing the Divine shefa, the spiritual force, down through the "orach atzilut" into the world of created things is the goal of human evolution. Here's more of P'tach Eliahu and a video with it being read in Aramaic. Keter is Brahman - the impersonal, absolute existence, or Godhead, the all-pervading transcendental reality, the implicate and implicit order. Because of Maya (Key 2), Brahman is concealed from the Atman (Tipharet). This is the completion of desire re-uniting with source. The realm of separating desire is among the lower sephirot, having first divided out of MALCHUT. 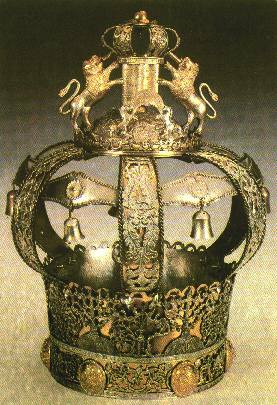 Torah crown by Yaakov Davidoff. Crowns appear in Keys 2, 3, 4, 5, 7, 11, 14, 16, Keter,and Malchut.